When I first started cooking, unless you had a garden it was rare to see any fresh beans other than green and wax beans in the market. Nowadays, particularly if you shop the farmers market or at farm stands you will find all types of beans from fresh fava to lima to cannellini to soy to —well, you get the idea. 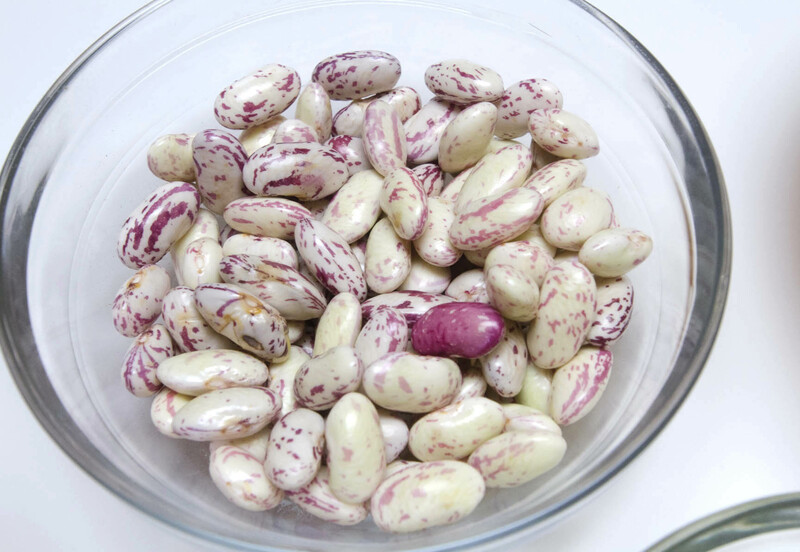 Among our favorite fresh (and dried) beans speckled cranberry beans stand out. Zingone’s, my trusted neighborhood market (which I glory in my most recent book, An American Family Cooks), always has them beginning in the early fall so they are frequently on our menu. Sometimes I just cook them in a little water or stock with some aromatics and herbs and use them to make salads. Other times I mix them up into a great baked bean dish as in the following recipe (which should easily serve 6). When the fresh ones are no longer on the market, I switch to dried beans from Rancho Gordo (www.ranchogordo.com) in Napa, California. Lightly coat the interior of a 2 quart casserole with olive oil. Combine the beans, tomatoes, sun-dried tomatoes, garlic, and sage in a large mixing bowl. Add the ⅓ cup extra virgin olive oil and season with salt and pepper. Pour the mixture into the prepared casserole and then add cold water to just barely cover the beans. Cover the entire casserole with aluminum foil to tightly seal. Poke a small hole in the center of the top to allow steam to escape. Transfer to the preheated oven and bake for about 1 hour or until the liquid has evaporated and the beans are very soft. Remove from the oven, uncover, and serve drizzled with extra virgin olive oil. The beans are also delicious served at room temperature with some balsamic vinegar added to the drizzle.